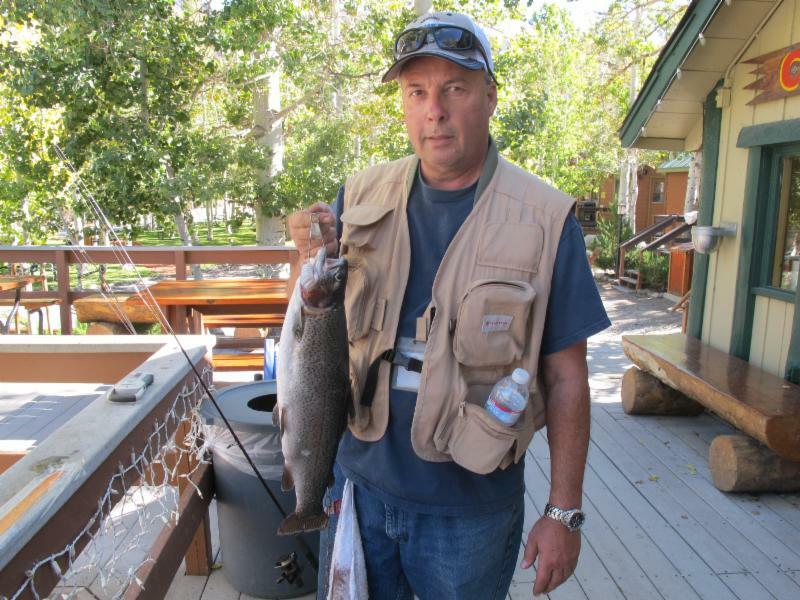 A good number of quality fish were caught this week at Convict Lake. Trolling has remained hot and is always an excellent fall tactic. This week anglers drowning bait and tossing lures had the best results. Patient anglers from boats and posted up on shore were catching some nice fish with inflated nightcrawlers and any garlic scented Powerbait. Also jigs like Powerworms, Micetails and my favorite, Sierra Slammer swimbaits were hooking up. Catch of the Week: Congratulations to Kathy Crose from Simi Valley, CA with a toad caught at the Jetty. She was using Powerbait when she scored this 5 pound 4 ounce rainbow for the "catch of the week". Great job Kathy! Tactics/Bait: Some of the top performing lures this week were Thomas Bouyants and Kastmasters. Gold, red and silver were the hot colors on the lures. Other lure that landed some nice fish were Sierra Slammers and Marvel Fly. The red/gold swim bait is my favorite Sierra Slammer to fish with and the purple Marvel Fly. For trolling use a rainbow Rapala, Needlefish or Tasmanian Devils. The most successful Powerbait color was peach. Any Powerbait with garlic scent or adding it to garlic dip continued to be deathly. All along the North Shore and areas near the Outlet were the hottest spots this week. Other locations fishing well were the Inlet, South Shore and Hangman Tree location. At the creek give salmon eggs or Velette cheese a try. Here is a list of other baits/lures that can be productive: Sierra Slammers, Tasmanian Devil, Green, purple or brown Marvel Fly Lures, Panther Martin, NeedleFish, Rooster Tails, and Bite-on Fury Shad or Lip Ripperz Hatchery Dust on Powerbait. Weather: The forecast for the beginning of next week will be mostly clear and sunny. Highs are going to be in the high-60's and the lows in the high-30's. The weather is away changing day to day in the high country. Make sure to visit the National Weather Service link which is usually accurate: 7-Day Forecast Convict Lake. Sunrise - Sunset: Sunrise this week 6:54am - 6:59am and Sunset 6:36pm - 6:27pm. Stocking: No stocking scheduled for next week.